It’s ‘hump’ day and despite the contained trading ranges across the various asset classes, investors have a lot to contend with, and strategize for, as we head towards the Autumn months which are expected to bring heightened volatility and risk aversion to financial markets. China and EM crisis risk – can they both be pushed deeper at the same time? U.K and E.U are preparing for a “special” summit in November – will the Irish be blamed for a “hard” Brexit and can PM Theresa May survive a leadership challenge? Telegraphed Fed rate hikes – is the market willing to accept two more Fed hikes by year-end? Trump, tariffs and trade – will the President go too far and hurt the U.S economy? U.S Midterms – pro-Democratic November election results? This morning across the asset classes, global equities mostly see red as investors’ assesse the outlook for global growth amidst heightened trade tensions. Oil prices are well supported as dealers try to get a handle on Hurricane Florence potential impact. U.S two-year yields trade atop a decade high as dealers nail down two more Fed rate hikes to close out this year. 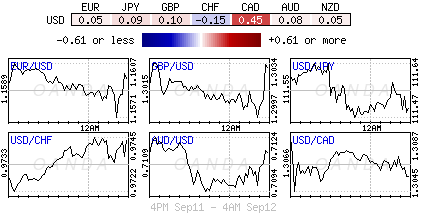 U.S 10’s have stalled their advance towards +3%, which is providing for a steady U.S dollar against G-10 currency pairs. On tap: The next three-days are busy on the data front. Today, it’s the release of U.S PPI (08:30 am EDT) and Aussie employment numbers (09:30 pm). Tomorrow, both the ECB and BoE deliver their monetary policy rate announcement and on Friday, both China and the U.S release their industrial production (IP) and retail sales prints. Market worries about escalation in the Sino-U.S trade war and the outcome of U.S-Japan trade talks negatively impacted Asian regional bourses in the overnight session. In Japan, the Nikkei fell -0.3% as chip-stocks followed the weakness of their U.S counterparts’ performance yesterday. Not helping was agriculture equipment maker Kubota plummeting after admitting falsifying data. The index closed out the previous session +1.3% higher. The broader Topix lost –0.7%. Down-under, Aussie shares ended lower on financials and miners. The S&P/ASX 200 index fell -0.1% at the close of trade, having risen +0.6% Tuesday. The index has now fallen for nine of the last 10 sessions. In S. Korea, the KOSPI stock index closed steady (-0.02%) overnight amid investor concerns about EM and the latest round of verbal threats in the Sino-U.S trade conflict. In China, stocks fell Wednesday morning, dragging the Shanghai Composite and the blue-chip CSI300 indexes down to new multi-year lows, on Sino-U.S trade worries, with China seeking WTO sanctions. The Shanghai Composite index was down -0.33%, while China’s blue-chip CSI300 index was down -0.61%. The declines continued for Hong Kong equities. The Hang Seng Index was off a further -0.5% as it officially entered bear-market territory. Indices: Stoxx600 +0.5% at 373.6, FTSE +0.12% 7282, DAX +0.% at 12030, CAC-40 -0.8% at 5326, IBEX-35 +0.2% at 9285, FTSE MIB +0.27% at 20909, SMI +0.6% at 8970, S&P 500 Futures +0.2%. Oil prices have rallied overnight after a report of a decline in U.S crude inventories and pending sanctions against Iran raised expectations of tightening supply, while top Russia warned of a fragile global market. U.S oil prices also found support from hurricane Florence that is threatening U.S East Coast fuel markets. 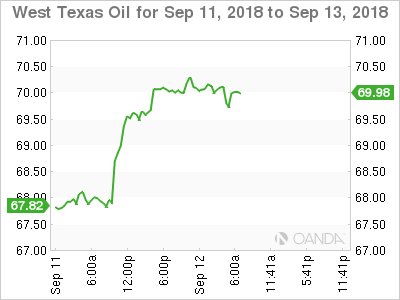 U.S West Texas Intermediate (WTI) crude futures are at +$69.93 per barrel, up +68c, or +1% from Tuesday’s close – WTI futures gained +2.5% yesterday. Brent crude futures have climbed +30c, or +0.4%, to +$79.36 a barrel – Brent gained +2.2% yesterday. Also providing support is U.S inventories. API data Tuesday showed a large drawdown in inventories. Stocks fell by -8.6m barrels in the week to Sept. 7 to +395.9M. Expect dealers to take their cue from today’s EIA inventory report. 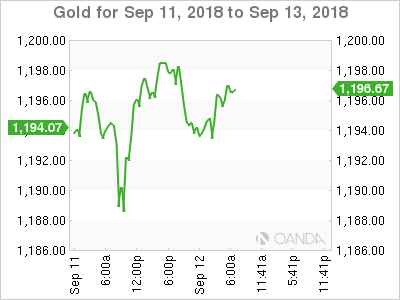 Ahead of the U.S open, gold prices have edged a tad lower as the key technical resistance level (+$1,200) continues to act as a deterrent for the ‘yellow’ metal and as the Yuan weakened outright on fears the U.S-China trade war could escalate. Spot gold is down -0.3% at +$1,194.08 an ounce, after hitting its lowest since Aug. 24 at +$1,187.21 yesterday. U.S gold futures are down -0.3% at +$1,198.90 an ounce. Both the ECB and BoE will hold their respective policy meetings tomorrow. Neither CB is expected to make any major policy changes. The demand for safe-haven government debt has also been weak this month by declining fears about the political situation in Italy, where a new populist government is working on its first budget proposal. They expect to adhere to the E.U rules and regulations. Overnight, the selling of high-grade sovereign bonds was led by Europe, with the 10-year German Bund yield backing up to +0.431% from Tuesday’s +0.404%. In the U.K, the 10-year Gilt yield increased to +1.498% from +1.470%. Stateside, U.S government bond prices are also lower as the market braces for the possibility of tighter monetary policy – a further two rate hikes are been priced in by Fed by the end of 2018. U.S 10’s are trading just shy of the psychological +3% level at +2.97%. 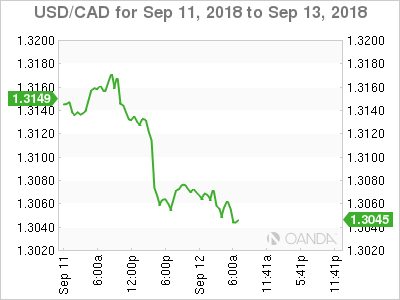 Late yesterday afternoon, USD/CAD (C$1.3048) encountered a heavy sell-off on Nafta optimism comments by President Trump. Currently, the pair remains under pressure with the 20-period moving average standing below the 50-period one. According to the techies, the RSI has broken below the ‘over-sold’ area of 30, showing a strong downside momentum. Investors should expect key resistance to be located just north of C$1.3100 and as long as this key resistance is not penetrated, intraday “bearishness” should remain in vogue. Sterling (£1.2998) briefly penetrated the £1.3000 support level after the BBC reported a group of about 50 lawmakers in PM Theresa May’s government had met to discuss “how and when” they could force her out of her job. The pound (£1.3040) was able to rebound and recoup all of its Euro-session losses on favourable Brexit comments E.U’s Juncker. Finally, SEK (€10.4848) remains in ‘no man’s land’ after last Sunday’s inconclusive general election, which witnessed the rise of ‘right.’ As Sweden requires political clarity and if the parliamentary deadlock cannot be broken and new elections are announced, some of the political risk premium in the run-up to the vote could easily return. 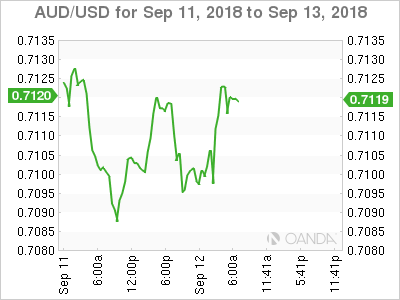 Data down-under overnight showed that Australian consumer confidence plummeted -3% in September in the wake of the political row among the ruling conservatives. Digging deeper and politics aside, rising Aussie mortgage rates and household-budget pressures are also weighing on consumer optimism. All index components fell versus last months prints, while the reading for the next five-years’ economic outlook slid the most at -5.8%.